Colts - 1st place, AFC South. The Colts were more than a bit stunned. The Colts's (6-0) perfect start to the season appeared to be in jeopardy as The Rams Quarterback Mark Bulger marched the Rams 80 yards and capped it off with a 21-yard touchdown run from Steven Jackson off the start of The Colts kickoff in less than 3 minutes. Immediately following, The Rams then recovered a fumble on the kickoff and turned it into a Jeff Wilkins 29 yard field goal. Again the Rams kicked off to The Colts, Edge ran the ball for 9 and then 1 yards for the first down but after a penalty on Stokley for a false start and several incomplete passes by Manning, The Colts were unable to produce a second 1st down and had to punt. Again The Rams made thier way downfield to finish it off with a 57 yard touchdown strike to Kevin Curtis to put St Louis 17-0 in front all in less than 12 minutes into the first quarter. Much to the shock of Colts fans packed into the RCA Dome in Indianapolis and leaving a dazed Colts defense and sputtering offense wondering what was going on. After moving the ball downfield and ending up on St. Louis' 30 yard line on a 4th and 9, Vanderjacht came on field to put a score on the board. 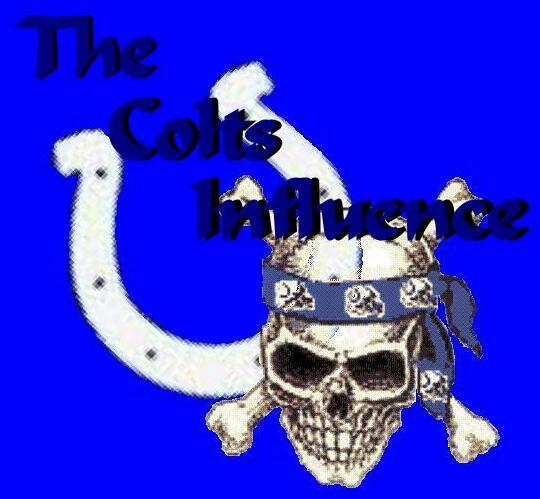 Colts nightmare just got worse as Mikey kicked wide left and the field goal was no good! The Rams now had possesion as Bulger began to move the ball. 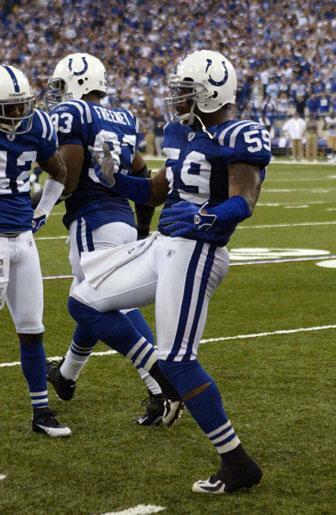 Then a spark of life came to the Colts as the whole game turned around when Cato June intervened with the pass intended for Torry Holt and returned it for 36 yards. Whereas June intercepted now made him and the rest of the Colts offensive players and in turn made The Rams the defensive team leaving quarterback Marc Bulger unprotected and vulnerable. Bulger took a hard block from Colts linebacker David Thornton as he put himself in position to try to make a play on Cato June and incredibly the Rams quarterback dropped his shoulder of his throwing arm to absorb the blow. "He definitely had things rolling for them early on." Said Corey Simon, "Things weren't going our way at the time. We just needed one play to turn it around. That interception really started things moving in the right direction for us." From that point on, The Rams Monday Night Football highlight reel faded to darkness as Manning and the Colts offense took command. 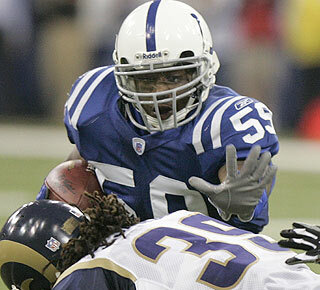 The Rams defense running mostly a Nickel set to prevent the pass was edged out across the field as Edgerrin James got off to a fast start, pounding the Rams defense with aggression. At one point in this Colts drive Edgerrin had fumbled the ball at the Rams' 5-yard line and a crowd of blue and gold jerseys piled atop each other. Without even seeing where or who had the ball under this pile, referee Gerald Austin indicated Rams ball recovered by Corey Ivy. As part of its broadcast, ABC had a microphone on Manning, who's normally measured in his public comments, and played some of his remarks during the game. "No, no, look. No, look, No. He's got it back. No, look at it. He got it back. He got it back. You got to wait Jerry," Manning screamed to referee Gerald Austin. "You gotta wait. Blue ball. Blue ball. Blue ball. Blue ball. He's got it." The end result was proven that Edgerrin James had the ball. Two plays later Edge scored on a 1-yard dive into the end zone to cut the Rams' lead to 17-7. The Colts forced a Rams punt, and on the next possession Manning led the Colts on an 86-yard drive that ended with the first touchdown of the night - a 3-yard TD pass to Reggie Wayne, making it 17-14. 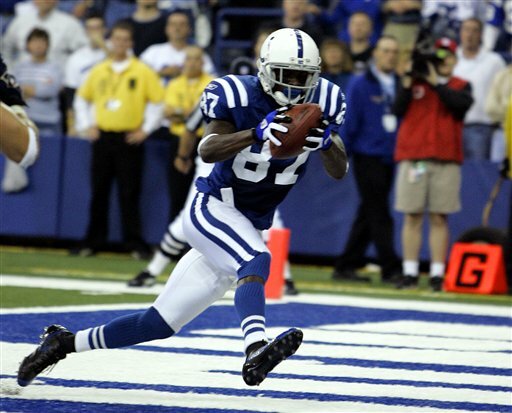 Reggie Wayne celebrates after a second quarter score. The Rams responded with a 49-yard field goal from Wilkins with 30 seconds left in the half making it 20-14, Rams..
Mike Vanderjagt opened the second half with 22 yard field goal with The Colts still trailing 20-17. Rams ball with Running Back Steven Jackson up the middle and Dwight Freeney at his back door. Jackson fumbles the ball on St. Louis' 40 yard line and Nick Harper recovers and returns it for 7 yards. Colts ball! Seven plays later, Edjerrin James rumbles in from eight yards out for his second touchdown of the night and The Colts took the lead at 24-20. Rams ball as relief Quarterback, Jamie Martin passes to RB, Brandon Manumaleuna and once again Cato June steps up and makes his second interception of the night. 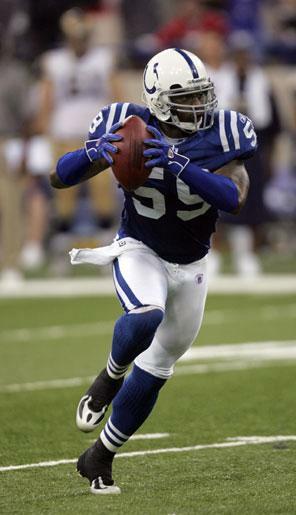 After ending the third quarter with Dominic Rhodes replacing Edgerrin James and running 4 plays, Rhodes starts the fourth quarter with a one yard run into the endzone. Score is now 31-20 - Colts. Colts Kicker, Dave Rayner kicked for 65 yards putting the ball on Rams 5 yard line as Rams ran it back for 20 yards to the Rams 15 yard line. With Rams Running Back, Steven Jackson only gaining 1 yard on thier 1st play and a gain of zero on the next play and a Mathis Sack Attack of minus 14 yards on the next play, Rams ended punting from thier 2 yard line. 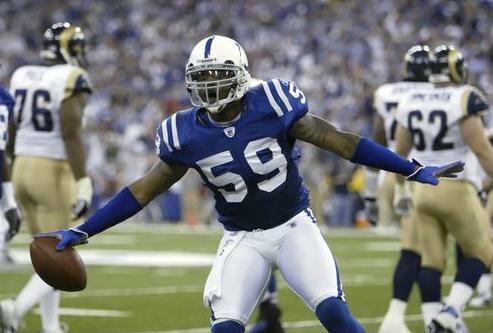 Dwight Freeney chipped in with a forced fumble when Robert Mathis took over the NFL sack lead with seven sacks. Mathis has at least one in every game this season. Indianapolis Colts again with the ball drove six plays down the field to cap it off with Peyton Manning reading Rams strong safety Adam Archuleta cheating away from Harrison's side, leaving the Colts receiver one-on-one with cornerback Travis Fisher. Marvin Harrison, as he has done so many times in his 10-year career, faked inside then ran out toward the side of the end zone. Manning made the check and fired a perfect pass over Marvin's shoulder. Harrison planted his left foot and then, displaying his usual body control, dragged the toe of his right. Harrison, Manning Move into First Place on another All-Time List. 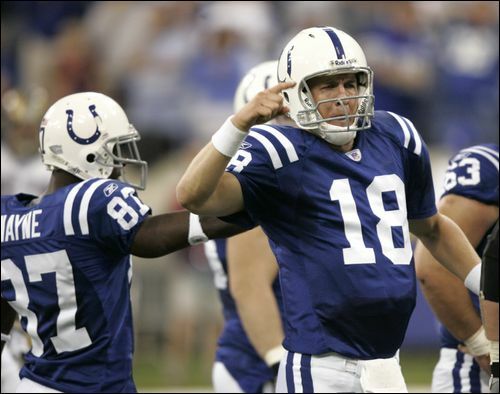 The six-yard touchdown pass from Peyton Manning to Marvin Harrison made the duo the most successful pass-catch partnership in NFL history. It was the 86th time Manning had found Harrison in the endzone, breaking the record of 85 held by San Francisco 49ers Steve Young and Jerry Rice. "It's been a long time coming," Harrison said. "Everything we've got, we're deserved. "I'm just happy to get it out of way and a lot more to come. "It started the day Peyton came here. He's a guy who wanted to win, came in here and took charge." Afterward, Manning ran to congratulate Harrison. Harrison handed the ball to Manning, who rarely keeps his touchdown passes because receivers generally keep them. Manning pushed the ball back toward Harrison. "I just kind of went over there to congratulate him and he kind of gave me the ball and I sort of gave it back to him," Manning said. "He gave it to me and I said, 'No,' so we decided we're going to split it somehow." On the Rams next drive, relief QB Jamie Martin threw a 17 yard pass to WR Kevin Curtis however it was intercepted by Nick Harper and returned for 21 yards to the Rams 10 yard line. 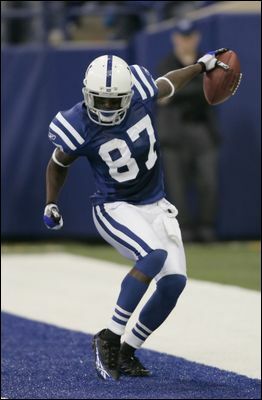 On thier first play Manning hit Marvin Harrison who fell short one yard of the end zone. 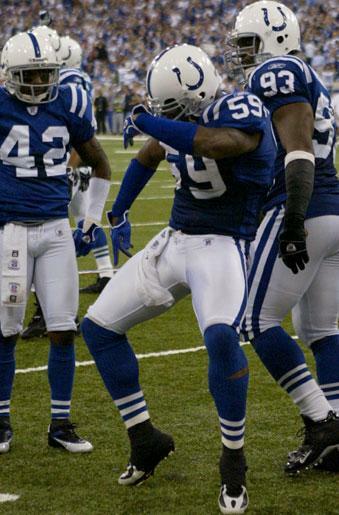 That left Edgerrin James to run it up the middle for a one yard touchdown! With 3:34 left in the game The Rams finally squeezed out another touchdown concluding with a two point conversion ran in by Marshall Faulk. Jim Sorgi in at Colts Quaterback finished out the game. Manning finished the night completing 22-of-32 passes for 191 yards and a pair of scores, while running back Edgerrin James rushed for 143 yards and three touchdowns. Bulger, who missed two weeks after injuring his shoulder last season, said he expects to be out about that long this time. James has 44 games of 100 or more yards rushing in 87 career games. The Colts are 38-6 when he gets more than 100. June had two interceptions against San Francisco last week, the first time a Colts player has had consecutive weeks of multiple interceptions since Stan White in 1977. Mike Vanderjagt's 22-yard field goal in the third quarter was the 200th of his career. Four of them set up Colts' touchdown drives of 34, 35, 14 and 19 yards. They were the guts of a 45-3 comeback that lifted the home team out of a 17-0 hole, keeping it the NFL's lone unbeaten team (6-0). The play of the game was June's first interception. 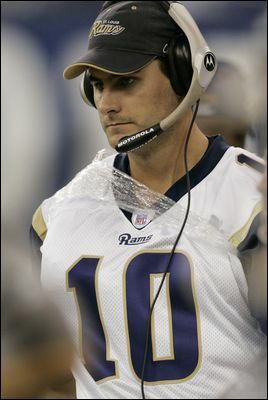 During the return, linebacker David Thornton's big block left St. Louis quarterback Marc Bulger with a sprained throwing shoulder and knocked him out of the game. The turnaround was immediate and permanent. Linebacker Cato June had two interceptions to increase his season total to five, including four in the past two games. 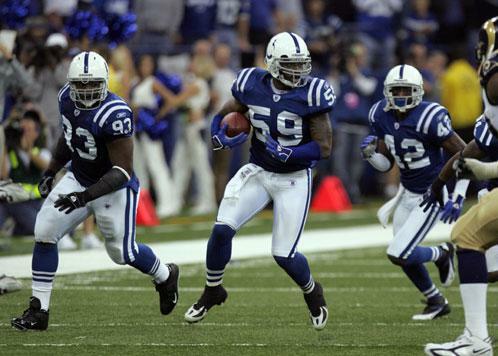 Running back Edgerrin James rushed 23 times for 143 yards and three touchdowns. The last time the Colts were 6-0 is the only time. Johnny Unitas was under center and defensive tackle Art Donovan was cracking heads, not jokes. It was 1958, and the Colts went on to win the NFL championship. The league's lone unbeaten team vs. its lone winless team. Big on small. Houston (0-5) is no fluke. It ranks 29th in total defense and 32nd in total offense, and injuries are slicing deep. On Monday Night Football, the NFL's lone unbeaten team, the Indianapolis Colts, will attempt to start a season 6-0 for the first time in 47 years, since the Weeb Ewbank-Johnny Unitas Colts of 1958. The Colts have allowed a league-low 29 points and have surrendered a total of two touchdowns in five games. The stingy Indianapolis Colts defense will be tested on Monday night when the high- powered St. Louis Rams visit the RCA Dome. The Rams are second in total offense, averaging 384.8 yards per game, and fourth in scoring at 25.6 points per game. The Rams defense is as bad as can be as two weeks ago they were torched by 45 points from Eli Manning, now big brother Peyton does him 3 better as the Rams, playing without thier head coach are led to slaughter on Monday Night, as the Colts win going away, with their defense also shutting down the Rams along the way. The last visit by the Rams to Indianapolis came on October 1, 1995 which was a 21-18 Colts win. As good as the Indianapolis Colts defense has played this season, it will receive its stiffest test yet when the St. Louis Rams bring their high-powered offense to the RCA Dome for a Monday night game. The Colts have given up an NFL-low 29 points through five games and have allowed just two touchdowns over 20 quarters of play. Still, people continue to question just how good the competition has been during the team's 5-0 start. But the quality of the Rams' offense - annually one of the league's best - will certainly provide a clearer picture of just how far the Indianapolis defense has come. "They're way more explosive than anybody we've seen," Colts coach Tony Dungy said. "They're by far the best we've played yet, in terms of moving the ball and scoring and getting big plays, of anybody we've played so far. "That's their offense. They throw, they throw deep routes and they're going to throw deep routes that take a long time to come open." The Colts should enter this game a lot healthier than the Rams. As of Thursday afternoon, the Colts did not have a starter or key backup listed as "out" or "doubtful," and their only starter that is even "questionable" is FS Bob Sanders. In comparison, the Rams likely will be without WR Isaac Bruce (doubtful, toe), who has missed the last two games, and also have two key starters listed as questionable in WR Torry Holt (knee) and DC DeJuan Groce (hamstring). The Rams can overcome the loss of Bruce because they have good depth at the wide receiver position with Kevin Curtis, Shaun McDonald and Dane Looker. However, if Holt is unable to play, or if he is significantly affected by the knee injury, it will be almost impossible for the Rams to keep up with the Colts. The Rams must adjust to being without their leader. Coach Mike Martz will not be on the sidelines when the Rams visit the RCA Dome to face the NFL's only undefeated team, the Indianapolis Colts. The 54-year-old coach has been ailing for weeks and announced Monday he's taking an indefinite leave of absence to recover from an apparent heart infection that an initial round of antibiotics couldn't cure. Assistant coach Joe Vitt will direct the Rams in Martz's absence. The Colts used the second overall pick in the 1994 draft on Marshall Faulk. After trading Faulk to St. Louis prior to the '99 draft, they used the fourth overall selection on Edgerrin James. Both will be in action Monday night in the RCA Dome. It will mark the first time they've played in the same game. Peyton Manning and Marvin Harrison will try again to set the NFL record for most passing touchdowns by a quarterback-receiver tandem. They failed to break their tie (85 TDs) with the 49ers' Steve Young and Jerry Rice on Sunday in San Francisco. Now they have a chance to do it in front of the home crowd. Against a Rams' secondary that has been exploited for 10 passing touchdowns already this season, it promises to be a record-breaking Monday night in Indy.